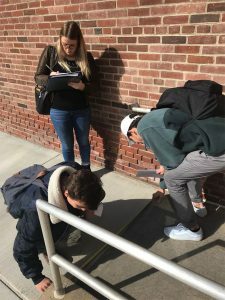 During the training, students used measuring tapes, door pressure gauges, and inclinometers to examine spaces and access. To prepare students in Falk College’s Venue Management course to advocate for inclusive facilities access as future sport venue and events professionals, assistant professor of sport management, Jamie Kim, incorporated “Inclusive U” training into her syllabus this fall. Twelve students took the 10-hour online training program offered by the Inclusive Recreation Resource Center, supported by the New York State Developmental Disabilities Planning Council (NYS DDPC). As part of the training, students used measurement tapes, door pressure gauge, and inclinometers to examine spaces, access, and equipment. After completion of the training to learn about accessibility and inclusive buildings, students are now Certified Inclusivity Assessors able to conduct inclusivity assessments.